It’s official: Fall is here. That means it’s finally time to break out the sweaters, boots and Pumpkin Spice Lattes. Besides the gorgeous weather and changing leaves, my favorite thing about fall is definitely the food. There seems to be cinnamon and pumpkin flavored everything this time of year (but I’m not complaining). It may seem almost impossible to make delicious fall treats in your dorm without a proper kitchen, but I’m here to show you three easy and dorm-friendly recipes to get your fix of homemade fall flavors this season. Everyone loves a good PSL, but just imagine it IN CAKE FORM. Yes, there is a way to bake mini cakes using only your microwave. This specific recipe includes pumpkin cake mix and instant espresso powder to really give you that PSL flavor. Just combine the ingredients in a mug, zap it in the microwave for a minute or so and bam, Pumpkin Spice Latte cake in mug. It doesn’t get better than this. With all the treats that come with the fall season, so do the extra calories. So if you are looking to avoid that Fall 15 (I just made that up, but it’s definitely real), this recipe is for you. It’s super simple; all you need are some green apples and caramel. The recipe I’m referencing says to carve out little balls of apple with a melon baller, but I would just cut the apple into slices, because who actually has a mellon baller? Dunk your apple pieces into the caramel and then top them with whatever you please. The recipe calls for peanuts, but I would recommend pretzel pieces, cinnamon or chocolate chips. The fall element in this recipe is the caramel apples, because nothing says fall like gooey, sour fruit on a stick, right? There is no better feeling than enjoying a warm drink on a chilly fall day. Those hot chocolates from Starbucks are amazing, but getting them often can start to add up. 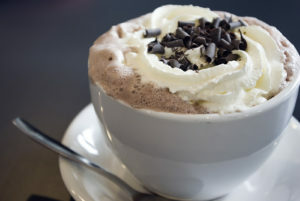 This is an easy hot chocolate you can make in your microwave that tastes even better than the Miss Swiss packets AND Starbucks because it has a secret ingredient: nutella. Just warm up some milk in the microwave, and add a huge spoonful (or two) of Nutella. I like adding a dash of cinnamon or nutmeg for a little spice because it adds that extra fall flavor. Warning: this is addicting and you will want to make it every day. If you ever find yourself hungry in your dorm, desperate for that PSL or caramel apple, you know what to do. Three easy, fall recipes that are dorm-friendly and super tasty. Enjoy!